Polygamists, monsters, boxers and geezettes. 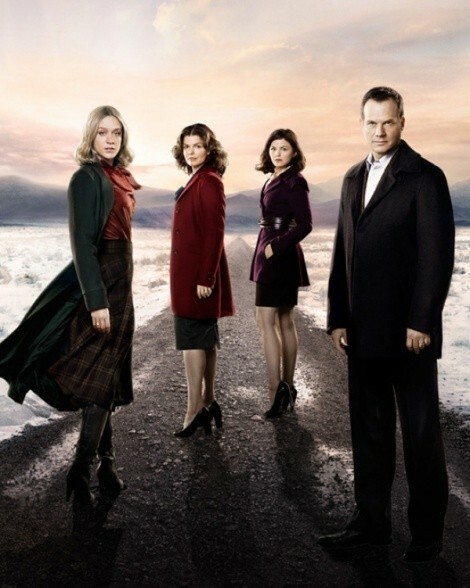 Season Premiere: This is the fifth and final season for Big Love, and damned if it doesn’t feel like the Henricksons’ last stand right out of the gate—the premiere opens with the extended clan in desert exile after patriarch Bill (Bill Paxton) publicly outed them as polygamists upon winning a Utah Senate seat at the end of Season 4. It’s just a camping getaway, but the allegory is clear: The family can’t blend into society unnoticed anymore. Margene’s (Ginnifer Goodwin) lost her budding home-shopping empire; Nicki (Chloe Sevigny) and Barb (Jeanne Tripplehorn) are stared at and/or accosted in public; the children are bullied at school; Bill’s facing a hostile reception on Capitol Hill and angry employees in his Home Plus stores. The public backlash is akin to Mel Gibson marrying three Kate Gosselins, even in friendly ol’ Salt Lake City. After four seasons of skating by with little legal or moral consequence, Big Love’s final run is looking like a hard, dark winter of payment come due. Fortunately, it’s also more focused in the homestretch (let’s just forget last year’s Mormon casino subplot) and will likely end, in famous HBO fashion, either satisfyingly (see: Six Feet Under) or contentiously (see: The Sopranos), no in-between. Oh, and look for not one, but two City Weekly appearances in Sunday’s premiere episode. Series Debut: The original British version of Being Human (seen stateside on BBC America) has such a loyal, protective cult following that SyFy’s Americanized remake is screwed from the outset—with them, anyway. For the uninitiated, Being Human USA is one of the better SyFy dramas to come along in years, especially compared to lightweight sci-fare like Eureka and Warehouse 13, or crap like Sanctuary. The setup remains the same: A vampire (Sam Witwer), a werewolf (Sam Huntington) and a ghost (Meaghan Rath) share an apartment and look out for one another while trying to live undetected amongst—and, more importantly, not kill—humans. Yes, a pre-emptive Twilight joke is cracked early on. Besides moving the show from Bristol to Boston and prettying up the vamp (Witwer looks like a prissy catalog model compared to the U.K. version’s longhaired Irishman), SyFy’s Being Human throws enough of its own unique twists to avoid simply being an American clone—kind of like, say, The Office did all those years ago. Don’t write it off without a look. New Series: Once you get past the Rocky-isms (former boxing champ retires to be with his family, opens own gym, falls on financial hard times, takes side gig as strong-arm debt collector, mulls ring comeback/rematch … whew … at least there’s no “Eye of the Tiger”), Lights Out is a down ’n’ dirty drama about a desperate man: Patrick “Lights” Leary (Holt McCallany) is hitting 40 and still questioning his title loss to the much-better-nicknamed “Death Row” Reynolds (Billy Brown) five years ago. We all know from the first mention of that “controversial” ring decision that a rematch is coming; it’s the way that Lights Out methodically (and slowly—13 episodes stretching into April) reveals what lengths Leary will go to re-prove himself that sustains the tension. If The Shield had gloves instead of guns, it’d be Lights Out.